So I still have the iPhone 6S in rose gold and I absolutely love it. I've been an iPhone girl for years now. I just love apple products and I really can't fault them. Well, except for the battery life but that's why power bars and portable chargers were invented for. 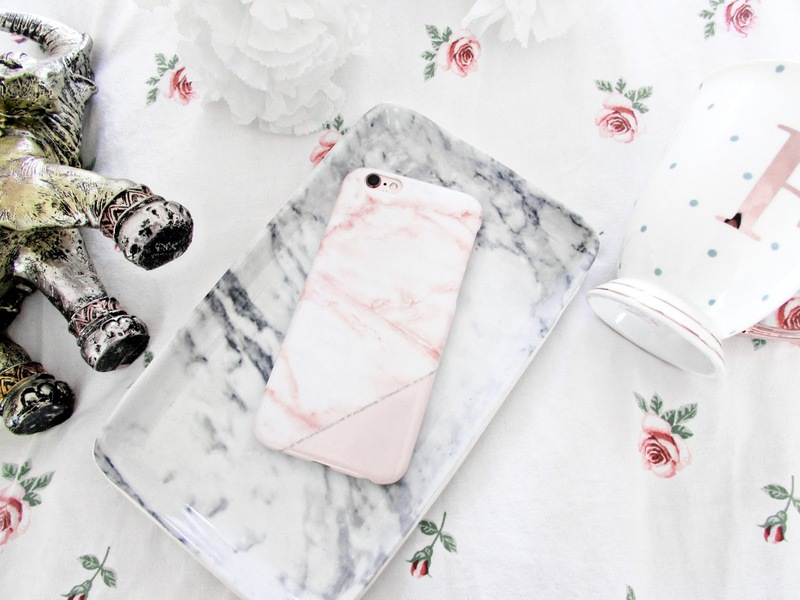 On my iPhone I have a pretty marble case from Coconut Lane which is the Luxe Marble Blush Case which I absolutely bloomin' love! 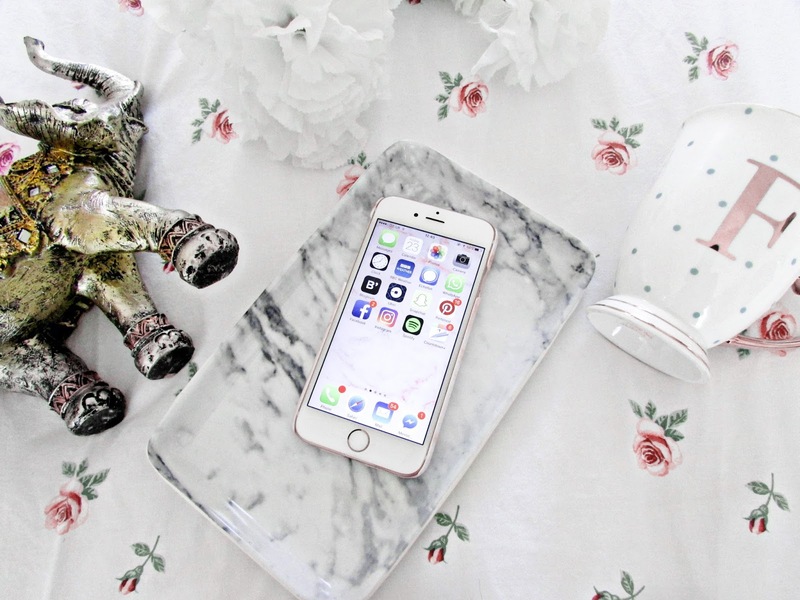 I think it's so pretty and sophisticated and hello, it's marble...like what more could a girl want? I just love it. It was on the pricey side at £25 but I think it's so pretty and definitely worth it. My background is a picture I took when I was in Mauritius. We stayed at this hotel and that was my view and I'm so proud of that photo. It's definitely the best photo I have ever taken. Totally unedited. I absolutely love it. 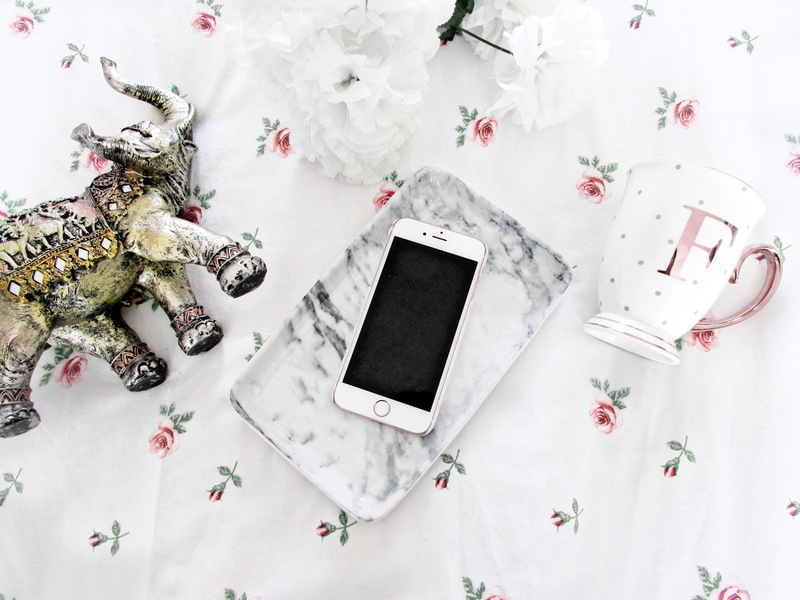 My main background when you open the phone up is just a plain pink marble background that matches my phone care. Can you tell that I am a bit obsessed? So I have a wide variety of apps on my phone. 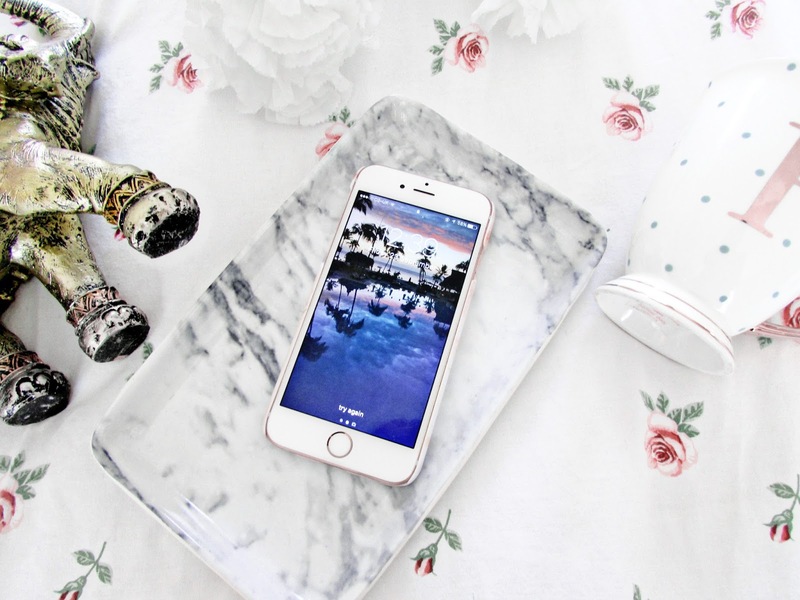 I love changing it up and I love browsing the app store for new apps that I can use in my every day life so here are some of my absolute favorite apps at the moment. Bloglovin': I can't write this post without talking about bloglovin' now can I? But I absolutely love this app. It's just absolutely perfect for finding new blogs to follow. It's also perfect for keeping your favorite posts in one place as you can save them and refer back to them if need be. I love bloglovin' as it's perfect for keeping track of your posts and is just the perfect place for people to follow you and follow other amazing bloggers as well. Snapchat: I just bloomin' love snapchat! I love following my friends, favorite bloggers and yes even celebrities on there and just seeing what they get up too. I also love the different filters that they are always bringing out. Snapchat is just such a fun app and even though I didn't totally get it at first I'm definitely obsessed at the moment. My name is fleur_danielle so definitely follow me on there if you are not already. Instagram: Like with everyone else in the blogging community at the moment I have a bit of a love hate relationship with this app since they've made so many changes to it but I still love posting pictures and browsing other photos on this app as well. It's amazing for seeing different photography images and how people take photos. I just love it and definitely need to get back into posting photos on it. VSCOCam: Leading on from instagram I also love VSCOCam. It's the app I use to edit my instagram photos and I absolutely love it as there is just so much you can do on it. I love the different filters and ways that you can edit photos. My favorite filter to use at the moment is A5. I just love the way it really brightens up a dull photo. If you'd like to see a how I edit my photos then be sure to leave me a comment below. Spotify: As corny as it sounds music is a big part of my life and even though I have an ipod with the majority of my songs on I still absolutely love spotify. I just love coming across new bands and artists and different music. I love creating my own playlists as well as following other people on there and seeing what different music and artists they love listening too as well. It's just a fab app. Publish: This is an app I've downloaded recently and I absolutely love it. It's basically another app to help you schedule tweets which is core when you're a blogger. I absolutely love it as it;'s so simple to use and is definitely one of the best apps I've used in ages in terms of scheduling tweets. I just can't seem to get along with any of the others. Best Fiends: I am absolutely addicted to this game to the point where it's actually an unhealthy obsession. I absolutely love it. It's such as graphically pleasing game and is really good fun to play. I'd highly recommend downloading it. You basically have different characters that you have to grow and there are different objectives for each level of the game. It's just so much fun even if it is a little tricky at times. I'd highly recommend downloading it. Fever: A friend at work told me about this app and I am super happy he did as I absolutely love it. It's basically an app that tells you different things to do where you live at the weekend, that night or whenever really. It's perfect for last minute planning or if you don't know what to do but want to go out this can definitely help you decided that. It also gives you the prices of whats going on too and there is definitely something for every budget whatever your interest on there. It's such a fab app and it's free too. Bonus! Pacer: This is like pedometer and tracks how many steps you've done that day. It also has a workout section that can help you track your workouts which I think is amazing and definitely something that I've been using a lot. I just absolutely love it. It's helping me enjoy exercise. Who knew that was possible? Colorfy: If you've seen those adult coloring books in bookshops or seen photos of them on instagram but have never been able to buy one then this is basically the app version and I love it. It has ton of designs for you to just color in and it's just so incredibly therapeutic and relaxing and perfect again for long journeys. Bus Times: Living in London but not yet owning a car means that I have to rely on good old public transport however this app is incredible. Most bus stops these days have a little screen that tells you how long the bus is going to be however where I live the bus stops don't have this which is where this app comes in handy. It's just so accurate and lets you know how far the bus is and you can monitor it's location on the app as well. It's become my lifesaver. Just an amazing little app. Evernote: I am in love with this app. It's literally a bloggers dream as you can keep track of everything and it is just such a perfect way of keeping track of everything you've got going on. I absolutely love using this app to write blog posts on the go or draft up ideas or quickly jot down any notes for work or anything else that springs to mind. I can keep everything in this app and I just absolutely freakin' love it. Plant Nanny: Another recent addition to my phone is this adorable little app that is basically a reminder for you to drink more water. If you kill the plant then obviously you need to drink more. I'd be lying if I said I haven't killer it at least once and since I hate killing things I guess this is going to be my motivation to drink more water. Such a cute little idea that will make drinking water a lot more fun. I'd highly recommend it. So there we have it. Just some of my absolute favorite apps to use at the moment. I am always on my iPhone and downloading different apps so if you can think of any recommendations for me I'd love to hear your thoughts. Make sure you leave them in the comments below so that I can have a read at your suggestions and then download them. Do you use any of the apps listed here? What are your favorite apps on your phone?